Welcome to the world of Arctopolis! You exist in this large, vast world. You just start by saying that you just started. You will play with your username, and you will pick any kind of element you can find or come up with, which will give you buffs. 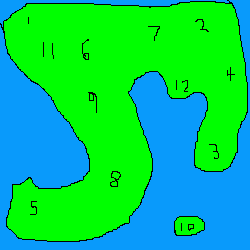 Also, you will start in a random start point, marked by numbers in the map above. Members of the Earthly are usually Neutral to other factions. Members of the Heavenly are usually Helpful to the earthly. The satanish faction is the faction believes that Arctopolis must belong to the dark minions of Satan, they believe that any defyers must be enslaved, killed, or spirit wombed. Members of this faction have an increased strength and defense stat. Members of the Satanish are usually Aggressive towards the earthly. The Forsaken are the only who believe in no higher being, they believe that they must kill every defyer and keep the world of Arctopolis to themselves. Members of this faction have an overall increase of stats. Members of the Forsaken are aggressive to all. Eh, never really liked the concept of randomized factions and stats depending on them. Factions are actually a side thing, they only give tiny boosts also. He is part of the Heavenly! Are you ready to be created? trees cover this area, there seems to be water at some distance to the east as you can see. Different animals exist here, as birds and squirrels and deer. Oh, you forgot to choose an element? You didn't manage to gather wood, but you succeed to collect sticks. I collect enough grass and braid a rope with it, I then collect some stone. You collect some grass and make a very, very fragile rope. You fail to empower the rope with grass. You create a crude axe! I join the earthly faction and go and search my surroundings! It takes time, but you cut one tree and get one log. You are part of the Earthly Faction, want to have a one-time faction re-spin, or continue? You cut another tree, getting a log and an acorn.